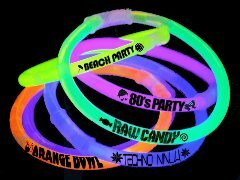 You want to custom print Glow Bracelets with a message or simply purchase some glow products for a fun event? You can feel confident that Glow Authority has the quality, reliability, and price that fit your needs! We have you covered for everything from simple birthday wishes to business logos. This is an amazing offer. You can now buy custom 8" Glow Bracelets online in only a few steps. All you have to do is choose the color of glowstick, 1 line of text, and a choice of 2 ink colors (White, Black). 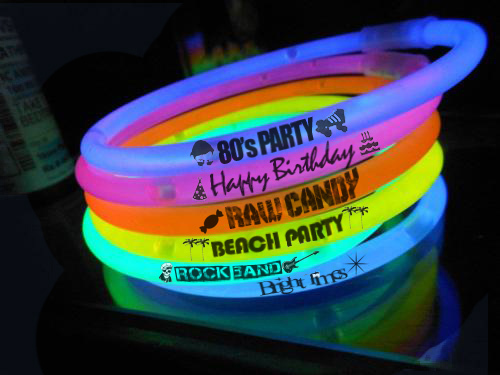 Each custom 8" Glow Bracelets works out to about $0.45 per unit and must be ordered in packs of 100.